Whey Protein Hydrolysate, Whey Protein Concentrate, Natural and artificial flavors Red Russet cocoa powder, Cellulose gum, Xanthin gum, Salt, Sucralose, Acesulfame-potassium. Whey Protein Hydrolysate, Whey Protein Concentrate, Natural and artificial flavors, Chocolate cookie pieces, Cellulose gum, Xanthin gum, Salt, Sucralose, Acesulfame-potassium. Whey Protein Hydrolysate, Whey Protein Concentrate, Natural and artificial flavors, Cellulose gum, Xanthin gum, Salt, Sucralose, Acesulfame-potassium. Manufactured on shared equipment which processes products containing milk, egg, soybeans, wheat, tree nuts, and peanuts. Settling may occur. Whey Protein Hydrolysate, Whey Protein Concentrate, Natural and Artificial Flavor, Salt, Soy Lecithin, Cellulose Gum, Xanthan Gum, Sucralose, Acesulfame Potassium. Contains Milk, Soy. 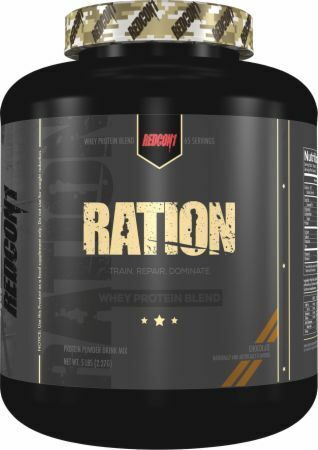 Jan 26, 2018 RedCon1 Ration Review: Phenomenally Unique Chocolate Flavor! PricePlow's RedCon1 Ration Review: This chocolate is INSANE! Read more about it on our RedCon1 Ration blog post! Cookies N' Cream This is a Buy 1 Get 1 FREE offer! Peanut Butter Chocolate This is a Buy 1 Get 1 FREE offer!